As noted by studies performed by NASA Ames Human Systems Integration Division (Mr. Alan Hobbs): "Maintenance is essential to aviation safety, yet improper maintenance contributes to a significant proportion of aviation accidents and incidents. This is because a small percentage of maintenance tasks are performed incorrectly or are omitted due to human error. Examples include parts installed incorrectly, missing parts, and the omission of necessary checks. Maintenance personnel are confronted with a set of human factors unique within aviation. Maintenance technicians work in an environment that is more hazardous than most other jobs in the labor force. The work may be carried out at heights, in confined spaces, in numbing cold or sweltering heat. The work can be physically strenuous, yet it requires clerical skills and attention to detail." DVI’s Aviation Maintenance Experts have industry experience working at major airline maintenance depots, FAA repair facilities, engine overhaul shops, accessory overhaul shops, military repair facilities, and at general aviation fixed base operators. Our Maintenance Experts have performed major repairs and alterations on all types of aircraft. The GA fleet is being used well beyond the flight hours and years envisioned when the airplanes were designed. There is concern that continued airworthiness safety matters will become more common as the fleet ages. These airplanes could develop serious age-related problems as they continue to be used well beyond their envisioned design life. The bulk of the fleet is designed to Civil Aviation Regulations (CAR) 3 standards that were established in the 1950s or earlier. These standards lack fatigue and continued airworthiness requirements as part of their certification. However, little is known about the condition of these old airplanes and the general effects of aging on them. 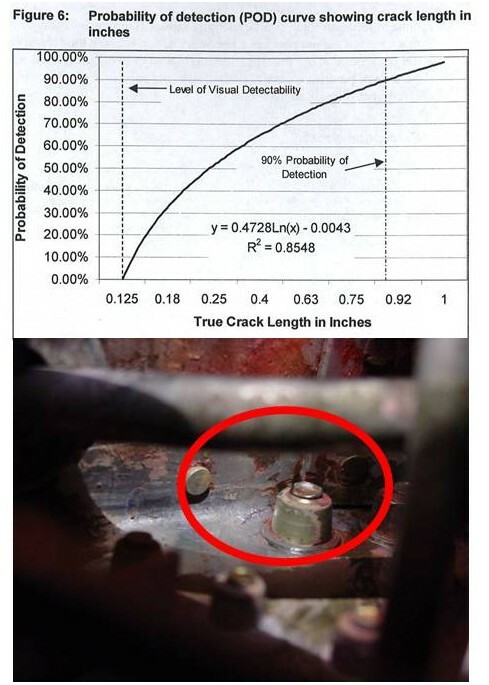 As seen below the probability of detecting cracks are a function of crack length, and on many older airframe structures, in the absence of maintenance instruction that direct an inspector to a specific are to look at, cracks can be difficult to detect.